Spheric Music – Axess “Aviator” out now – Chain D.L.K. 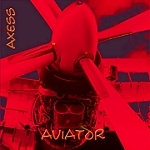 The german artist Axel Stupplich (Axess) turns his fascination for aviation into electronic music. The Pyramid Peak Keyboarder creates a sound experience by using powerful beats and harmonic melodies like as if you are on a plane flying above the earth. Total running time/ Laufzeit: 74 min.